Sarcoidosis is a systemic disease with unknown cause, characterized by noncaseating granulomas, predominantly in the lungs and intrathoracic lymph nodes. Sarcoidosis is associated with a broad spectrum of extrapulmonary involvement, including renal manifestations. 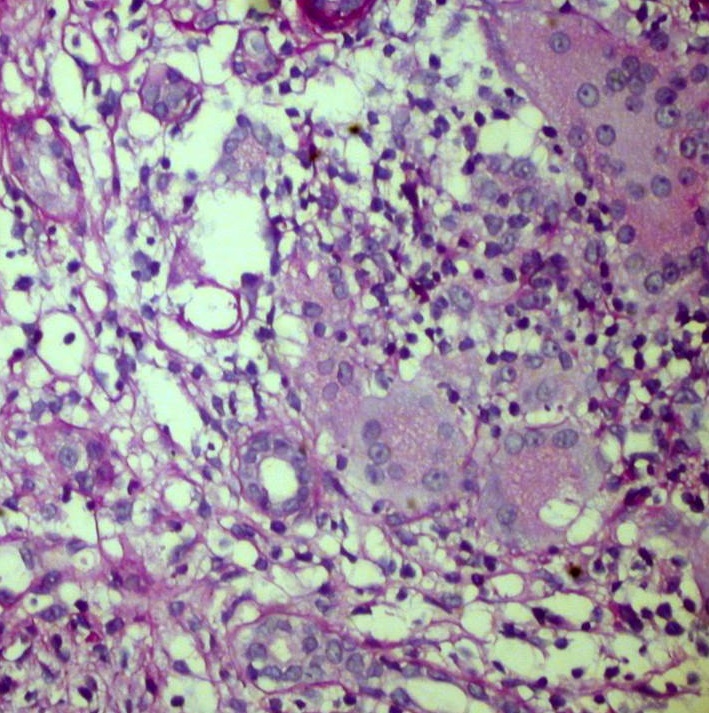 Interstitial granulomatous nephritis is the most typical finding; another characteristic feature is kidney damage due to disordered calcium homeostasis, driven by calcitriol hyperactivity of macrophages, and leading to acute kidney injury, nephrocalcinosis, nephrolithiasis, tubular dysfunction etc. Treatment is always required for renal and other end-organ damage; corticosteroids are the mainstay of therapy. We present a case of sarcoidosis with both interstitial granulomas and kidney stones, complicated by acute kidney injury, and successfully treated with corticosteroids. Sarcoidosis is a systemic disease, affecting predominantly lungs and intrathoracic lymph nodes (75-90%), but also involving many other organs, including skin, eyes, bone marrow, liver, spleen, nose, throat, salivary glands, joints, central nervous system, heart, endocrine and gastrointestinal system, and also kidneys [1,2]. The cause of the disease is not known - as yet, no bacterial, fungal, or viral antigen has been consistently isolated from the sarcoidosis lesions. Sarcoidosis is neither a malignant nor an autoimmune disease, however, both genetic and environmental factors seem to play a role, and reaction to an unidentified antigen is suspected, despite the cellular immune response occurs in the absence of a clearly defined immunological target [3-6]. The characteristic presentation of sarcoidosis is noncaseating granulomas, predominantly in the lungs and intrathoracic lymph nodes, but also in kidney interstitium. However sarcoidosis is associated with a broad spectrum of renal manifestations beyond granulomatous interstitial nephritis. The incidence of renal involvement ranges from 23% up to 48% with a wide spectrum of abnormalities [1,2,7,8]. 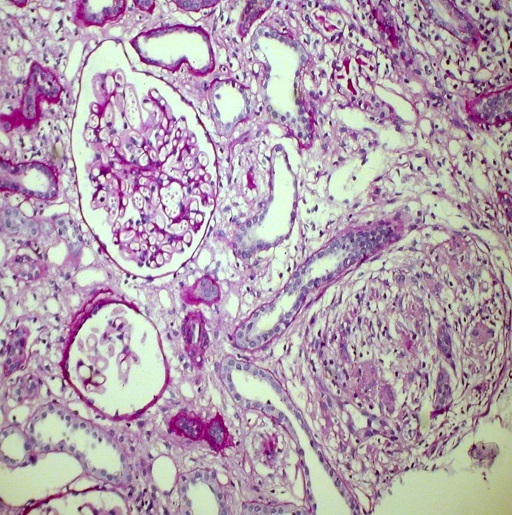 Interstitial granulomatous nephritis is the most typical histological finding, but development of renal insufficiency is unusual, while the most important cause of renal dysfunction is a disordered calcium metabolism. Hypercalcaemia, caused by calcitriol hyperactivity of macrophages, presents in 10–17% of patients with sarcoidosis, hypercalciuria in 40–62% of patients [8-10]. A disordered calcium homeostasis is responsible for the development of renal dysfunction by several different mechanisms. Hypercalcaemia promotes a decrease in glomerular filtration rate by vasoconstriction of the afferent arteriole; inhibits sodium-potassium ATP-ase leading to urinary sodium wasting with polyuria and dehydration; urinary concentration is impaired by a decreased sensitivity to anti-diuretic hormone; acute tubular necrosis may result from intracellular calcium overload and tubular obstruction by calcium precipitates. Hypercalciuria predisposes to nephrolithiasis and obstructive uropathy. Untreated, chronic hypercalcaemia and hypercalciuria cause a progressive tubulointerstitial inflammation with associated calcium deposits leading to nephrocalcinosis, which is the leading cause of chronic kidney disease in sarcoidosis. In the acute phase, the consequences of hypercalcaemia and hypercalciuria are reversible. Once fibrotic lesions have developed due to longstanding disease, the damage is irreversible [9,11,12]. Tubular dysfunction is frequently associated both with hypercalcaemia and granulomatous interstitial nephritis. It may present as isolated proximal or distal tubular acidosis, Fanconi syndrome, urinary concentration defects or metabolic alkalosis. Obstructive uropathy is usually due to nephrolithiasis. Retroperitoneal fibrosis, retroperitoneal lymph nodes and ureteral, urethral or bladder obstruction by sarcoid involvement can also cause obstructive disease [9,13]. Granulomatous angiitis is a rare complication of sarcoidosis and can involve the renal artery; it is often accompanied by arterial hypertension . Glomerular involvement in sarcoidosis is rare, although a variety of different lesions have been described including membranous nephropathy, focal segmental sclerosis, IgA nephropathy and crescentic glomerulonephritis [14,15]. Different types of renal sarcoidosis had also been reported to coexist [7,11,12]. Treatment is always required for renal, cardiac, ocular and neurologic manifestations of sarcoidosis, given the substantial risk of end-organ damage [16-18]. Patients with severe (>3.5 mmol/L) or symptomatic hypercalcaemia require intravenous saline hydration as initial therapy . The specific treatment is aimed to treatment of the underlying disorder. Corticosteroids are the mainstay of therapy. Most authors recommend starting with an initial dose of 0.5–1 mg per kg oral prednisone once daily depending on the severity of the disease. After 4 weeks of treatment, the dose can be tapered by 5 mg each week until a daily dose of 5–10 mg is reached. Noncorticosteroid agents are being increasingly tried. Common indications for the initiation of such agents include steroid-resistant disease, intolerable adverse effects, or patient desire not to take corticosteroids [7,9-12,16,17]. Here we present a case of sarcoidosis with combined kidney involvement, successfully treated with corticosteroids. Asian male, 39 years old, was referred to Nephrology, Moscow Botkin Memorial Hospital, September 2 2015. Main complains: general weakness, decreased appetite, weight loss, frequent urination and eye redness. Previous medical history: combined hemorrhoid since age of 20, pneumonia 5 years ago. History of current disease: February 2014 he developed unexplained painful erythematous rush on lower extremities, resolved spontaneously. March 2014 he underwent surgery due to hemorrhoids bleeding. Since that time erythematous rush recurred, over next year patient experienced chest pain, headache, low-grade fever, weight loss, constipation, dry mouth, and noticed hoarseness. Outpatient work-up in December 2014 found elevated serum creatinine, no further investigation was performed. August 2015 he was admitted to local urology clinic with his serum creatinine raised up to 377 µmol/L, kidney ultrasound and plain urography revealed non-obstructive stone in the left pelvis. He underwent percutaneous nephrolithotomy and simultaneous left kidney biopsy. Biopsy specimens were sent for evaluation to Nephropathology Department, Moscow City Nephrology Centre. Kidney biopsy: Pathology evaluation by light microscopy with H&E, PAS and Masson-trichrome staining’s (Figures 1-4) showed 16 otherwise normal glomeruli. Interstitial changes were represented by diffuse-focal lymphohystiocytic infiltration and multiple large granulomas, constituted by epithelioid and giant multinucleated cells, without significant periphery lymphoid reaction. Severe interstitial oedema and diffuse-focal interstitial fibrosis and tubular atrophy were also seen. Arteries and arterioles were otherwise normal. Immune staining’s were negative for IgA, IgG, IgM, C3 and κ and λ light chains and fibrinogen. Pathology conclusion: granulomatous interstitial nephritis. Patient was referred to our unit for consultation. Urgent work-up and treatment: point-of-care blood test for calcium was performed and showed total calcium 3.39 mmol/L. Patient was urgently admitted, and started with normal saline infusions 2500 ml/day. At admission: conscious, alert, oriented, slightly depressed. Body temperature 37.4°C, RR 18 per minute, pulse regular 80 per minute, BP 130/80 mm Hg. Pale, undernourished. Dry skin, no peripheral oedema, neither palpable peripheral lymph nodes. Joints: no swelling, movements not restricted. Eyes: moderate ocular injection. Hoarseness, ENT and neck otherwise normal. Lungs: no dullness to percussion, any rhonchi, wheezes or rubs. Heart: regular rhythm, no murmur. Abdomen soft, non-tender, bowel sounds normal. Liver +1 cm below rib arch, non-painful, spleen and kidneys not felt. Frequent urination, mainly nocturnal. Urine is colourless, urine output 3200 ml/day. Blood chemistry: creatinine 249 µmol/L, urea 10.2 mmol/L, total protein 61 g/L, albumin 31 g/L, potassium 3.3 mmol/L, ionized calcium 1.63 mmol/L, pH 7.27. Phosphorous, serum iron, sodium, chloride, uric acid, glucose, albumin, cholesterol, bilirubin, liver enzymes - within normal range. Urinalysis: SG 1008, pH 7, protein 0.37 g/L, glucose 2.6 mmol/L, RBC 1-3, WBC 40-45 hpf. Autoimmune screening: CRP 18 mg/L; RF, anti-DNA antibodies, anticardiolipin antibodies, pANCA, cANCA, IgG, IgA, IgM – all within normal range. Abdomen and kidneys ultrasound: hepatosplenomegaly. Kidneys are enlarged: right 132x50, left 145x63 mm, with hyperechoic parenchyma 22-25 mm. Mild bilateral collecting system dilatation: right pelvis 20 mm, calices 18 mm, left pelvis 15 mm, calices 10 mm. Multiple small kidney stones 5-7 mm in calices of both kidneys. No visible retroperitoneal lymph nodes. Thyroid gland and peripheral lymph nodes ultrasound: unremarkable. Chest CT: ground-glass areas and small nodules in lower lobes of both lungs. 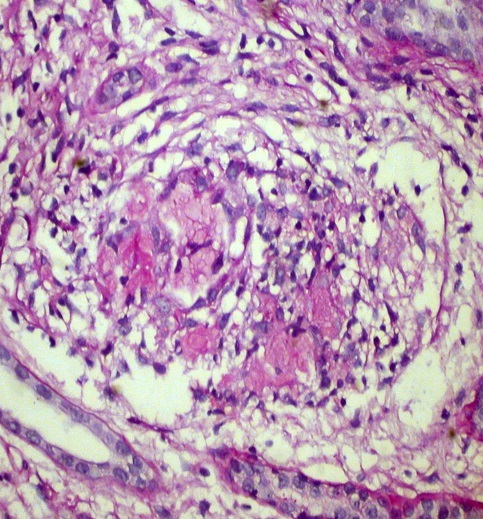 Multiple intrathoracic lymph nodes, located in upper mediastinum, around trachea bifurcation and right lung hilum, diameter up to 11 mm (Figure 5). ENT specialist consult: ENT otherwise normal. Pulmonologist’s consult: Generalized sarcoidosis with lung and intrathoracic lymph nodes involvement. Treatment: Patient was started with oral prednisone 40 mg/day, normal saline infusions continued. Treatment results and follow-up: Patient’s condition dramatically improved within 2 days, in 10 days his serum creatinine lowered to 190 µmol/L, total calcium decreased to 2.44 mmol/L, ionized calcium - to 1.29 mmol/L. Weakness, eye redness and hoarseness resolved, appetite improved, stool and urination normalized. He was discharged and continued prednisone at home. Outpatient consult a month later: no complains, gained 3 kilos of weight, creatinine 162 µmol/L, ionized calcium 1.23 mmol/L, urinalysis otherwise normal. Slow tapering of prednisone was recommended. Chest CT 2 months later showed partial resolution of ground-glass changes and lymph nodes reduction. At the latest outpatient consult in February 2016 (6 months after the diagnosis and start of treatment) patient doing well, asymptomatic, gained 5 kilos of weight, serum creatinine 136 µmol/L, total and ionized calcium within normal range, urinalysis unremarkable. His prednisone dose is 10 mg/day. Middle-aged male patient with systemic manifestations - erythema nodosum, chest pain, low-grade fever, weight loss, constipation, polyuria, dry mouth, hoarseness and eye redness, gradually developing during 18 months, was admitted to urology clinic with elevated serum creatinine level. He was diagnosed with non-obstructive left pelvis stone, which did not explain his impaired kidney function. That was the indication for kidney biopsy, performed simultaneously with percutaneous nephrolithotomy. Kidney biopsy revealed granulomatous interstitial nephritis and prompted nephrologist consult. Given clinical systemic presentation and pathology findings, sarcoidosis was suspected. Urgent blood test for calcium showed total calcium 3.39 mmol/L, which demanded immediate admission and start of normal saline infusions. Chest CT found intrathoracic lymp node enlargement and fibrotic changes in both lungs, compatible to the diagnosis of sarcoidisis. Search of alternative explanation for pulmonary-renal syndrome with pauci-immune granulomatous interstitial nephritis, ruled out ANCA-associated vasculitis, tubulointerstitial nephritis with uveitis, and tuberculosis. Based on combination of kidney interstitial granulomas, intrathoracic lymph nodes enlargement, hypercalcaemia and history of erythema nodosum, patient was diagnosed with sarcoidosis with lung, intrathoracic lymph nodes, and renal involvement, and treated with 40 mg/day of oral prednisone along with continuous normal saline infusions. 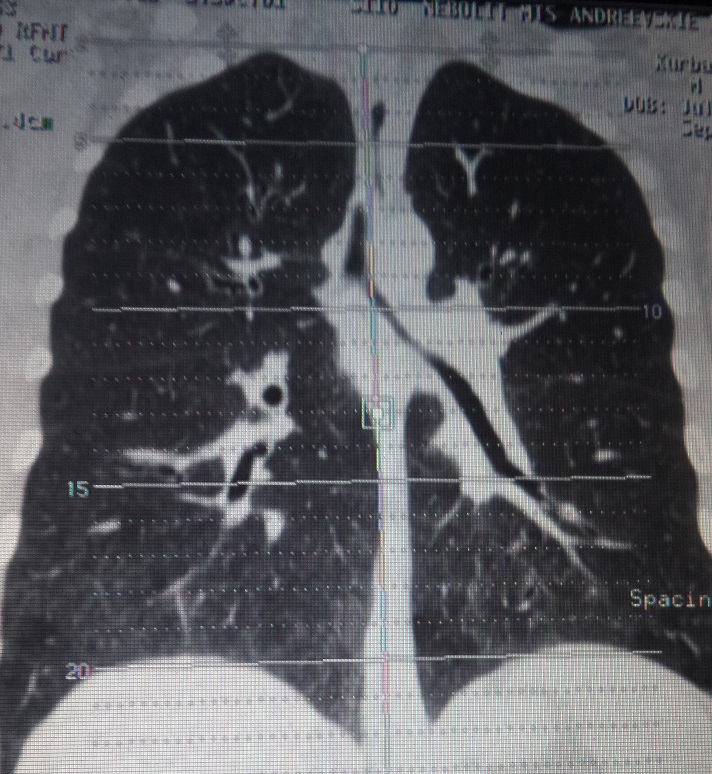 His symptoms resolved dramatically, and normocalcaemia with almost complete recovery of kidney function were achieved, as well as partial resolution of chest CT changes, which supported the diagnosis ex juvantibus. Retrospective interpretation allow to conclude, that most of signs and symptoms, like polyuria, kidney dysfunction, constipation, weight loss, dry mouth, hoarseness and red eyes were the result of severe hypercalcaemia [8-10]. That is confirmed by substantial recovery of kidney function, which was however incomplete because of prominent interstitial fibrosis, already existing at the time of diagnosis. We suppose that acute kidney injury on the top of chronic kidney disease both occurred due to hypercalcaemia, rather than to granulomatous interstitial nephritis [9,11-13]. Kidney stones (non-obstructive and not influencing kidney function), as well as glycosuria with normal blood glucose, in combination with acidosis, likely resulted from hypercalciuria [9,11,12], which we unfortunately were unable to prove. Acute kidney injury in sarcoidosis is rare, the most recent data from cohorts of 27 and 13 patients [20,21], confirm that the main cause are a balance anomaly of calcium or a parenchymal involvement. Interestingly, that renal biopsy performed in the second cohort, showed tubulo-interstitial nephritis in all patients, but granuloma only in 6 out of 13 . Kidney involvement in patients with systemic manifestations demand scrutinous evaluation, including kidney biopsy. 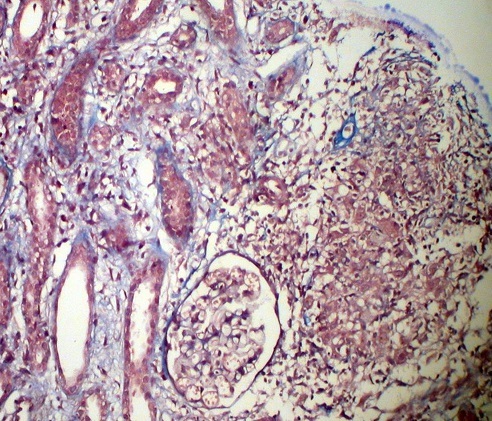 Biopsy findings guide further evaluation and may lead to diagnostics of rare conditions, such as sarcoidosis with granulomatous interstitial nephritis. Analysis and careful interpretation of all set of clinical data is mandatory for diagnostics of exceptionally rare conditions like combination of kidney stones, granulomatous interstitial nephritis and hypercalcaemic acute kidney injury. We have to thank doctors Ruslan Biktimirov, Sergey Borisov and Olga Vinogradova for their impact to diagnostics and treatment of the patient. None of authors have any competing interest. Statement on sarcoidosis (1999) Joint Statement of the American Thoracic Society (ATS), the European Respiratory Society (ERS) and the World Association of Sarcoidosis and Other Granulomatous Disorders (WASOG) adopted by the ATS Board of Directors and by the ERS Executive Committee, February 1999 (1999) Am J Respir Crit Care Med 160: 736–755. Mahfoudhi M, Gorsane I, Battikh AG, Turki S, Kaaroud H et al (2015) Epidemiological, Clinical and Follow-Up Data in a Series of Thirteen Renal Insufficiencies Complicating Sarcoidosis. Open Journal of Clinical Diagnostics 5: 50-53. Zakharova EV, Stolyarevich ES (2016) Sarcoidosis with combined kidney damage - kidney stones, granulomatous interstitial nephritis and acute kidney injury. Clin Case Rep Rev 1: doi: 10.15761/CCRR.1000231. Nephrology Department, Head, Botkin Memorial Hospita 125284, 2-nd Botkinsky proezd, 5, Moscow, Russian Federation, Tel: +7 967 134 6936; Fax: +7 495 945 1756.